Aquarian Shaman: Shamanism for a New Age: Real Wolves at Isis Cove! We had three incredible wolves at Isis Cove in the Venus Rising Sanctuary for over two hours on Tuesday! Wolf handler and wild-life educator, Rob Gudger, brought three of his beautiful wolves to Isis Cove for a visit and to share information with us about the nature and social habits of wolves. This will go down as one of the most memorable days and highlights of my life! I laid down for about 15 minutes on the floor with the white Arctic Alpha She Wolf and dreamt wolf dreams with her. I felt our wolf spirits join and merge and journey together even though we were in the midst of many people all around us. It reminded me of being with Grandma Twylah - she had several white wolves over the years. 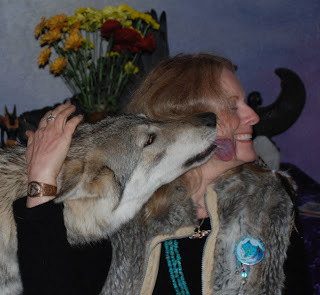 In my own Spirit Wolf journey the other night, when we were all allowing our personal spirit wolf to come to us, the white wolf came to me - and now she manifested in my outer world as well. Rob and his wolves, Amaroc, Mohican and Wayha, are available to present an eductional program about wolves to your organization. They visit camps, schools, retirement centers, festivals and other events. Topics include the hunting and social behaviors of wolves, the benefits of protecting wild wolves in natural ecosystems, conservation efforts, dispelling myths and misconceptions, and more! The wolves are incredibly gentle and will allow participants to pet them. Please visit Rob's website, Wolf Tales, to learn more. If you feel connected to the Spirit of the Wolf and would like to connect with other like-spirited Wolfies, please click HERE to learn about the Spirit Wolf pledge. Sending you all special blessings for the holidays!